We compare the top fans for wood stoves on the market so you can make an informed decision. Find out which one we would choose over all others. These days, wood-burning stoves and fires are becoming more popular than ever before. Not only do they look good, adding an additional feeling of coziness and warmth to the home, they also supply plenty of heat. One way to maximize your use of a wood stove is to invest in a heat activated fan which ensures that heat is effectively spread around your space. Do they work on every stove? Heat powered wood stove fans are an economical solution for warming your home in the most efficient way possible. Since they are capable of generating their own power you won’t need to worry about adding additional expense to your home heating bills. Not only that, but a non-electric fan for a wood stove will also help you to maximize your use of fuel, helping you to reduce your carbon footprint exponentially. The advantages are many and you’re sure to be impressed by the results that the best wood stove fan can provide. Of course, as you might imagine, there are plenty of different options when it comes to finding the right heat powered fan for you and with so many features to consider, it can be difficult to know where to begin your search. Our reviews are here to help you to make an informed decision band thanks to our expert guidance, you’ll know how to pick the perfect model to meet your individual requirements. Are you ready to find the right model to suit your needs? Whether you have a large living space, or a small room which you would like to warm more effectively without increasing your energy consumption, you’re sure to find a product on our top performing list that suits your requirements and meets your expectations. Take a look at how the top models compare in the table below. We review each device in more detail following the table. Find out more about these leading models as we take a closer look at the performance and stats. The ECOFAN AirMax will heat your rooms as much as 38% more quickly thanks to its intelligent engineering. Perfect for all kinds and sizes of room, the AirMax is the top performing model for efficient heat distribution. Proven and tested to help save you as much as 18% of you fuel, this model requires no batteries or electricity. Instead it converts the stove’s own heat into electricity to generate power. Tested during harsh conditions, this model offers outstanding performance and this is backed up by a two-year manufacturer’s warranty for your peace of mind. Wood stove fans on top of stoves take less space but circulate more warm air more deeply into the home, making you more comfortable more quickly. The perfect eco-friendly option to reduce your carbon footprint, the ECOFAN AirMax is self-regulating for greater convenience and is also whisper quiet so you won’t be disturbed. Capable of moving as much as 175 CFM, this large model comes in a choice of colors to suit your preferences and with its low minimum-operation temperature, you can rest assured that it will operate for the longest time when compared to rival models. Bottom Line: The one we'd choose over all others. It can be considered expensive when compared to the competition but in terms of fuel efficiency and heating time it will save more money in the long term. When it comes to wood stove fans, non-electric models are certainly the most economical since there is no need to pay any more on your energy bills to keep them running. The CWLAKON heat-powered fan requires no external power source to circulate warm air and it is highly effective at helping the heated air from a pellet or wood-burning fire to get around the space evenly. This model is self-powered thanks to the thermoelectric module which functions as a mini-generator powering the motor. With no need for electricity or batteries, it still manages to boost the circulation of warm air for better comfort and lower wood consumption, saving you money in the long run while also reducing your carbon footprint helping you to meet your eco-friendliness goals. 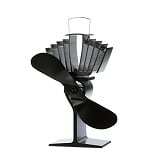 When you choose this heat powered stove fan, you can be confident that you are selecting a very safe design. 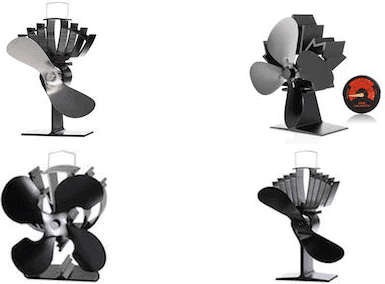 It is made from high quality anodized aluminum which can resist temperatures as high as 662 degrees Fahrenheit, there will be no discoloration or deformation even when operating the fan and stove for extended periods and at high temperatures. This ensures a long lifespan at maximum efficiency. If you are looking for heat activated fans that operate extremely quietly, the CWLAKON could be right for you. 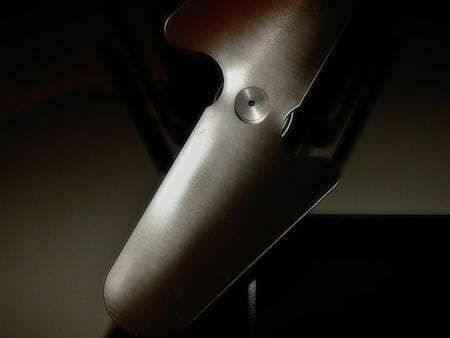 Thanks to its newly designed blade and its larger air volume, you can expect operation to be whisper quiet. You’ll never notice it but it’ll still be working perfectly in silence. Thanks to the bi-metallic safety device located in the device’s base this is a very durable and long-lasting device. Whenever the surface temperature exceeds approximately 400 degrees Fahrenheit, the safety device will gently elevate the fan’s front, thus protecting the motor and TEG. The bi-metallic strip below the base of the device automatically bends once the temperature has risen too high and this ensures that no damage from overheating can occur. As one additional positive feature, the built-in thermometer features an oversized magnet which won’t fall off the chimney even at a high temperature. With bright coloration, it can also be used to observe the furnace temperature at any time. Bottom Line: Excellent value for money. The cheapest model on the list and a good choice for smaller homes. 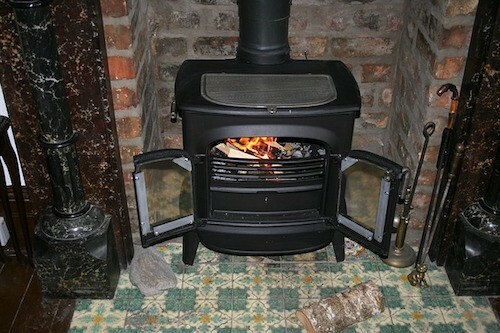 Recommended Article: Learn all about the top cheap pellet stoves in our latest guide. When using a standard wood stove, the heat rises vertically, however when you use the Voda 4 blade non-electric wood stove fan the warm air will be diverted horizontally, warming the entire room rather than just the ceiling and areas next to the stove. With no need for cords, electricity or batteries, this fan for a wood-burning stove is capable of generating power itself using the surface heat of the stove. The device’s base can transmit the heat into electricity generating units which then convert the energy produced by the heat into kinetic energy which drives the motor and makes the blades turn. Once the stove’s temperature has reached 185 degrees Fahrenheit, the blades begin to spin and as the base gets hotter, the blades will turn more rapidly. This model is perfect for use on a freestanding stove that has an average surface temperature measuring between 185- and 660-degrees Fahrenheit. If you’re looking for a model which is simple to install and which operates quietly, the Voda is perfect for you. Its silent operation means you won’t be disturbed while its anodized aluminum blades and base won’t corrode or rust for excellent longevity and durability. This fan for a wood stove top simply needs to be positioned close to the back or side of the stove pipe. Bottom Line: Offers excellent value for money. Not as refined or as efficient as either of the Canadian built ECOFAN models but a stand out in its price bracket. This ECOFAN model warms your room as much as 31% more rapidly than many of its similarly sized rivals and its mid-size design makes it perfect for rooms measuring up to 240 square feet. Proven and tested to save you as much as 14% of your fuel, the UltrAir ensures efficient heat distribution deeper into your home. The ECOFAN UltrAir requires no electricity but instead generates its own power through converting your wood stove’s own heat into electricity. Since it has been designed and built in Canada, you can have peace of mind in the quality of its performance. Designed for use with free-standing wood stoves, the ECOFAN is a unique accessory which operates extremely quietly but which nevertheless can move as much as 125 CFM. Available in a choice of three different colors it can operate at a stove surface temperature of 212–650-degrees Fahrenheit. Bottom Line: It's well built and runs very efficiently. A worthy alternative to the AirMax model. So, do you really need a stove fan? There is no single answer to that question, however if you’re wondering whether or not you could benefit from one, there’s only one thing to consider. Does your home feel warm and comfortable even on the coldest days? If not, you could benefit from a model which will ensure that the heat from your wood stove circulates more effectively around your home. Although there are lots of different models on the market today, they aren’t all equally high performing or well made. Some are poor quality and are made from inferior materials which could discolor or become damaged after ongoing exposure to high temperatures. You need to ensure that you have selected a model which can withstand extreme temperatures without any problems. You also need to take care to choose a model which has been tested and proven to effectively circulate air around your room rather than allowing it to go upwards and be lost at the ceiling. You should also check that your chosen fan operates quietly so that it won’t disturb you during use. Thanks to our expert product reviews, you should now be able to make a well-informed decision when it comes to selecting the right device to suit your needs. While any of the models that we have recommended here will keep your home comfortable and warm all year round, if we were going to recommend just one stove fan for you to try, we would have to suggest that you invest in the Ecofan AirMax. This large model is made by a well-known high-quality brand and has been proven to be extremely effective when it comes to air circulation in even larger spaces. 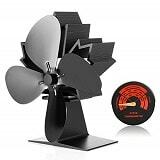 With its strong anodized aluminum construction and choice of three attractive colors, this well-designed and durably constructed stove fan will ensure that your home is well heated and that your energy bills feel the benefit. 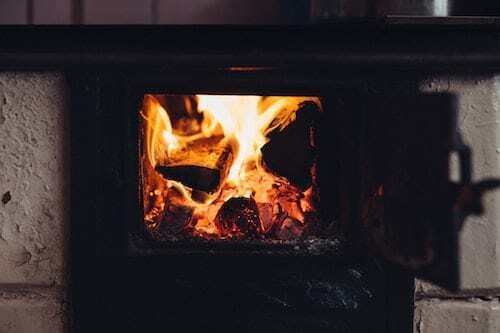 If you have a wood stove and are wondering whether a heat powered fan would be a good addition to your home, there are probably quite a lot of questions that you need answered. How do they work? What should you look for when choosing a stove fan? What else do you need to know about using a fan to heat your home more effectively? We address all of these issues so that you can make the right decisions for you. If you're a first time buyer then don't miss this section before reading our heat powered wood stove fan reviews. Recommended Reading: Don't miss our guide to the top performing small wood stoves! The very first question that most people ask about these devices is whether or not they need one in the first place. If you have already spent money on an expensive wood stove, you might be wondering why on Earth you should spend even more on buying a fan to sit on its surface. Yet there are several reasons why you should seriously consider making the investment. A wood-burning stove does get very hot, that much is true. However, if you have anything larger than a very small living space you probably find that on the coldest days the heat doesn’t distribute itself well around the room. If you’re hoping to heat other rooms as well, you will be out of luck. Unless you’re happy to sit right in front of the wood-burning stove, you might want to think about finding a way to distribute all that warmth more effectively around the room. A stove fan sits on top of the stove and prevents the heated air from escaping upwards and being lost, instead channelling it through the room so that you can stay cozy and warm no matter where you choose to sit. A stove top fan generates electricity for itself, so there isn’t any need for a battery or a power outlet. This means that you won’t need to spend any more money on your energy bills. A non-electric stove fan will begin to work once your stove has reached a set temperature and will then self-regulate effectively, working faster to channel the heat around the room when it is most needed. Even better, the best wood stove fans operate completely silently, so they won’t be noticed as you enjoy spending time in your comfortable, warm room. If you’re wondering just how a stove fan can work without any need for batteries or electricity, this will help to explain just how these clever appliances function. They use thermoelectricity to distribute heat about your room. The stove’s fan features a mini-motor inside it, which has two semi-conductors. When they are both at different temperatures, a small amount of electric power can be generated. When the base heats up and the fan’s top remains cooler, the heat differential drives the motor. In turn, this will rotate the blades. On the top of the device, there is a cooling system which keeps the top cooler than its base so that the blades continue spinning. In theory, they function on any type of wood-burning stove that gets hot enough on its top. There must, however, be sufficient space at the side or rear of the stove to enable optimal air flow and to ensure that the stove can reach the minimum temperature to activate the fan. 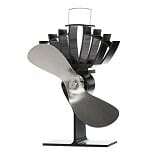 There are some stove fans on the market which are designed to be activated at a lower temperature. These are perfect for small wood stoves which are unable to reach very high temperatures. These models are ideal for helping to disperse heat more effectively even when your stove is unable to reach the high temperatures required for a conventional fan to function. Although you might think that it’s possible to position a stove fan anywhere on the top of your wood-burning stove, you need to think carefully about where you place it. You will need to put it on the stove top itself so the bottom will react to the heat of the stove to commence the thermoelectric process. The best place to position it is towards the rear of the stove without blocking the back with the wall or the stove’s flue. If you place it towards the side of the flue, with approximately 150 to 200mm at the rear, the stove fan will be able to receive sufficient cool air to function at its optimal level. Although the best stove fans are able to withstand very high temperatures it is still possible for them to overheat and become damaged. In some cases, these devices may actually cause the room to heat up too much and cause you to feel uncomfortable in your living space. If this happens, you can simply remove it from the stove top for some time until the room has cooled down a little. Also, a stove fan can become so hot that it burns out. Every model comes with its own maximum operating temperature. If you exceed this, the motor could be burned out or the device could be damaged. You can prevent this from happening by either removing it from the stove completely or moving it onto a cooler part of the stove. There are also stove thermometers available for sale which you can use to monitor your stove’s temperature. Once you are familiar with your stove and its fan, you will get a better idea of its temperature during use. These devices are especially useful for freestanding stoves which are in enclosed spaces such as a traditional open fireplace. In these types of spaces, the heat cannot properly disperse around the space and therefore a fan is highly beneficial to maximize the heat. It couldn’t be easier to use your fan. All you need to do is place it in the correct position on the top of the stove and wait until its temperature has reached the required minimum. The fan will start to spin and the fan will then regulate itself so that the heat maintains an optimal level for as long as you want the stove to stay in operation. Installing it couldn’t be simpler. All you have to do is place it close to the back of your wood stove but with sufficient space remaining at the rear of the fan. Make sure that the base of the fan is in contact with the wood stove itself, then light your stove, wait until it has reached the right temperature and your work is done. You don’t have to feel that you need to use your stove fan every time you want to use your wood-burning stove to heat your room. If you are already sitting close to the stove and are getting a comfortable amount of warmth, you won’t need to think about using the fan. However, if you are sitting else where in the space or want to heat another part of your home more effectively, you could benefit from bringing the stove fan into use. You will also find it very useful if you have a larger room and there are several people sitting in it. With the stove fan in use, you’ll find that everyone in the room can enjoy a better level of heat and comfort and not only the people who are lucky enough to have secured a spot close to the stove itself! Now that you know more about how to choose a wood-burning stove fan, you can make a more informed purchasing decision. The right model will make an enormous difference to the comfort level of your living spaces and will help you to enjoy your leisure time at home more than ever before. When you choose a well-made, high-quality model which has been designed to stand the test of time and to withstand high temperatures, you will be able to reap all the benefits of a cozy home without having to increase your carbon footprint or add extra cost to your home’s energy bills. Welcome to the world of warm living! Join our mailing list or follow us on social media to get notified of new articles going live here at TinyHouseHugeIdeas.com.